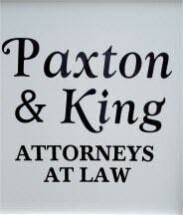 At Paxton & King, PLLC, we serve individuals, families and businesses throughout the Central City region of Kentucky. Our firm provides experienced guidance on a wide range of legal issues. We handle family law cases such as divorce, child custody, prenuptial agreements and adoptions. We also protect the rights of those injured in car accidents and other unfortunate accidents. In the personal injury arena, our lawyer has had success winning significant jury verdicts — including five- to seven-figure awards. We also provide experienced guidance on business law and real estate matters. Our attorney represents local businesses in conjunction with transactions, contracts, formation and disputes. We handle commercial litigation, collections and judgment enforcement, and we protect creditors' rights in bankruptcy. In the real estate area, we provide title opinions and commitments, and we handle real estate closings. The firm enjoys a well-established reputation in the area. Clients appreciate our dedicated work ethic and consistent communication. Our primary attorney, Jonathan King, brings nearly 25 years of legal experience to the practice. He works one-on-one with clients to provide individualized service. For more information, please call our office at 270-977-8200. We offer free initial consultations for personal injury matters. Evening appointments are available by request.